FRANKIE CARLL PRODUCTIONS BELIEVES . . .
-THAT YOUR PARTY IS AS IMPORTANT TO US AS IT IS TO YOU. -THAT OUR SERVICES WILL ENRICH AND ENHANCE YOUR WEDDING. -THAT CREATIVITY, QUALITY, AND ATTENTION-TO-DETAIL SEPARATE US FROM THE REST OF THE INDUSTRY. -THAT YOUR PARTY IS SPECIAL AND WE TREAT IT AS SUCH. -THAT OUR PEOPLE ARE THE MOST VALUABLE ASSET OF FRANKIE CARLL PRODUCTIONS. -THAT WHAT WE DO IS IMPORTANT AND WE LOVE WHAT WE DO. -WE ALSO BELIEVE IN 100% CUSTOMER SATISFACTION. -A CARING ATTITUDE THAT PUTS YOUR STYLE AND FEELINGS FIRST. -INNOVATION IN EVERYTHING WE DO AS A MEANS OF SUSTAINING A LEADERSHIP POSITION IN OUR INDUSTRY. -HONESTY IN ALL OF OUR DEALING WITH CLIENTS AND VENDORS. THEY GUIDE US IN EVERYTHING THAT WE DO. -REMEMBER THAT ENTERTAINMENT IS THE MOST IMPORTANT ELEMENT TO A SUCCESSFUL RECEPTION AND SHOULD NOT BE LEFT TO CHANCE. -GREAT ENTERTAINMENT IS CRUCIAL TO A FUN AND MEMORABLE RECEPTION. THE GUESS WORK OUT OF CHOOSING ENTERTAINMENT. -WE ARE DEDICATED TO WORKING WITH YOU IN PLANNING A DAY THAT IS SPECIAL; A DAY THAT SURPASSES YOUR DREAMS. YOUR WEDDING PHOTOGRAPHY AND VIDEO. . .
-GROWS IN VALUE WITH EACH PASSING YEAR! YOU WILL TREASURE THE MEMORIES FOREVER. -YOU WILL VIEW YOUR ALBUM AND WATCH YOUR WEDDING VIDEO FOREVER, IF THEY ARE TRULY SPECIAL. MAKE A DECISION TODAY. MAKE A DECISION TO SEEK OUT A COMPANY THAT PRIDES ITSELF IN THE PURSUIT OF EXCELLENCE IN WEDDING PHOTOGRAPHY AND VIDEOGRAPHY. WEDDING PHOTOGRAPHY AND VIDEO THAT IS TRULY EXCELLENT WILL INCREASE IN VALUE IN YOUR EYES WITH EACH PASSING YEAR. INVEST IN THE FUTURE. INVEST IN A TREASURE THAT YOU CAN HOLD ONTO. ENJOY A WEALTH OF MEMORIES FOR A LIFETIME WITH WEDDING PHOTOGRAPHY AND VIDEO CREATED BY US! CHOOSE FRANKIE CARLL PRODUCTIONS FOR THE BEST PARTY ENTERTAINMENT IN THE SCRANTON WILKES-BARRE AREA! Frankie started the business in 1984 moving from New York to pursue his dreams of owning a full service entertainment business. He expanded the business over the years to include Video & Photography creating a one stop shop. Kathleen was involved in sales for most of her career while maintaining a singing career with area bands. She grew through the years into a very professional front person and very talented lead singer. 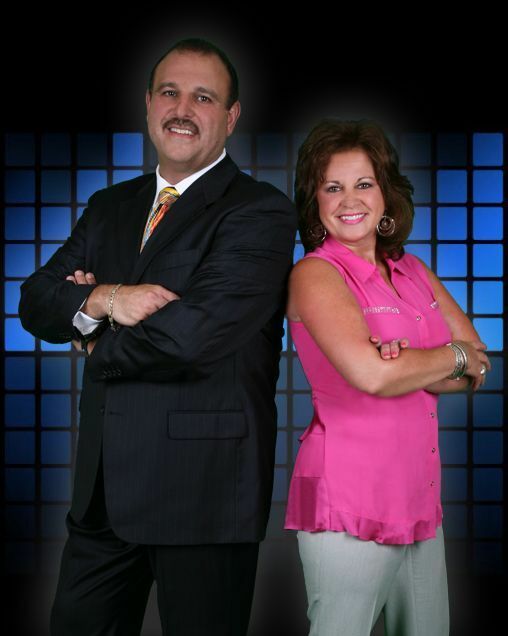 Kathleen and Frankie began their career together in 1991 with their band Fancy Dancer, which became a very popular band in Northeast Pennsylvania performing at thousands of weddings as well as doing floor shows in resorts from Atlantic City to the Pocono’s. Kathleen was responsible for a lot of the business’s growth over the past 20 years leading our sales department and organizing a lot of the day to day operations. The recent expansion into the photo booth business was her pet project. Frankie and Kathleen enjoy their life together with their two children Krista and Peter and their son-in-law Shawn who are also involved in the business. We are a very fortunate family to be in a business that we enjoy and have a tremendous passion for. Frankie Carll Productions is the leader in party fun! We offer DJs, Photography, Videography, and Photo-Video Booth services! The Frankie Carll Productions team is a perfect addition to weddings, receptions, birthdays, and any celebration! Your event will be more fun than you can imagine! Request Now!